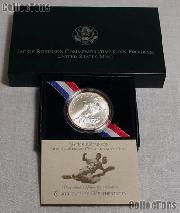 We are pleased to offer for sale this 1997-S Jackie Robinson 50th Anniversary Commemorative Uncirculated Silver Dollar. 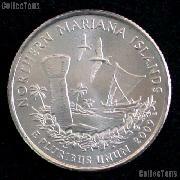 This Jackie Robinson BU Silver Dollar was minted in 1997 and is in Brilliant Uncirculated (BU) condition. This 1997-S Jackie Robinson BU Silver Dollar was produced by the U.S. Mint to commemorate the 50th Anniversary of Jackie Robinson's debut in Major League Baseball, when he broke the color barrier and won Rookie of the Year. There were 30,180 Jackie Robinson Uncirculated Silver Dollars minted at the San Francisco (S) Mint. The Jackie Robinson Uncirculated Silver Dollar is comprised of .900 (90%) silver and .100 (10%) copper with a diameter of 38.1mm and a weight of 26.73 grams. The obverse of the coin features Jackie Robinson sliding into home, engraved by Alfred Maletsky. The reverse of the Jackie Robinson BU Silver Dollar, engraved by T. James Ferrell, features a large seal with Jackie Robinson's name and a scroll that reads BREAKING BARRIERS. 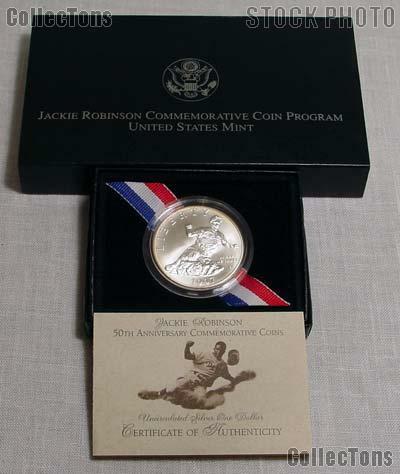 The 1997-S Jackie Robinson 50th Anniversary Commemorative Uncirculated Silver Dollar comes in the original U.S. Mint packaging, encapsulated and resting in a velvet lined case, in the Mint box, with the Certificate of Authenticity.